In the early 1800s a little village rose at the foot of the Blue Ridge Mountains in western Loudoun County along the main stagecoach route from Washingon DC to the Shenandoah River. 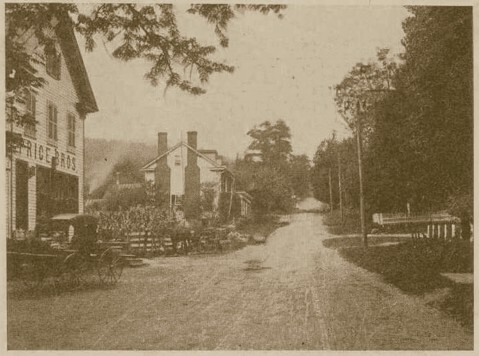 The village, originally called "Snickersville" for a Capt. Edward Snickers who ran a ferry across the nearby Shenandoah River in the 1760s, grew quickly, and in the 1840's a General Store opened for business to serve the local population and travelers. A railroad line was laid in 1907 from DC to the Blue Ridge, terminating at the street just above the store. The railroad hoped to encourage DC residents to escape the fetid summer air of the city for the cool "salubrious" mountain breezes, so they rechristened the town "Bluemont" for the beautiful, softly sloped mountains overlooking the town. 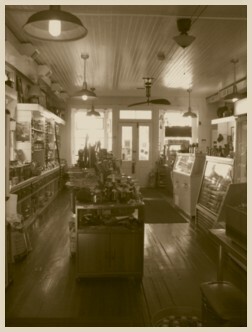 At that time the Rice brothers owned the store, maintaining a full stock of home and farm supplies for the locals while it offered the summer residents an engaging place to shop for local goods and produce. For three decades vacationers came and the town boomed. Automobiles and better roads replaced the train and stagecoach, allowing vacationers to range further afield once they had settled for the summer in the town. In the 1950 central air-conditioning had become commonplace, the summer heat no longer chasing the Washington DC residents to the countryside. Suddenly the sea shore became the place to spend summers, and the once busy summer of Bluemont quietly returned to a quiet gentle town full of scenic charm. In the 1980's a major 4 lane highway and expansion bridge was constructed just the north of the town to replace Bluemont's deeply winding gap with a straight throughway to funnel traffic west and east over the Shenandoah River. The once busy main road heading through Bluemont slowed to become merely a local traveled byway. In 2006 the declining store was purchased by Broad Run Veterinary Service, Inc. who spiffed up the centuries old interior and exterior with a fresh coat of paint, along with a promise to maintain the store's 170 year history of serving the community's needs. Today visitors and locals still stop by the Bluemont General Store to pick up fresh eggs and milk, or order their own layers for egg production, read the paper, browse among the eclectic collection of gifts and local offerings, and sit outside on the porch under the 100 year old spreading maple tree to catch up on gossip old and new.